Americans have a love-hate relationship with artificial sweeteners stretching back over 50 years; 86 percent of Americans use them, according to the University of Pennsylvania School of Nursing, but many people worry about potential side effects. Sucralose, made from a chemically altered sugar molecule -- commercially available as Splenda -- has received its share of negative publicity since it first entered general use as a sweetener in 1999. However, no studies have proven serious adverse effects from its use. Sucralose, like many artificial sugars, passes through the gastrointestinal tract intact, so that very few calories, if any, are absorbed. Eating excessive amounts of sucralose may cause diarrhea, bloating and gas. Gastrointestinal symptoms might occur because of reactions between bacteria in the intestines and components of sucralose that together produce nitrogen gas. 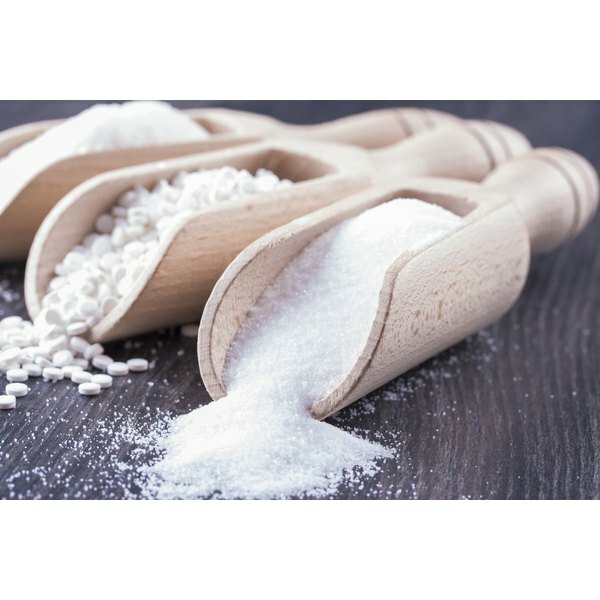 Symptoms may occur because the undigested sucralose draws water into the intestine, producing diarrhea, according to health educators at Columbia University’s Go Ask Alice website. Abdominal pain that feels like a pulled muscle also occurs in some people, according to anecdotal reports. In animal studies, sucralose decreased beneficial bacteria in the intestines. Lead author Rajendrakumar Patel, M.D., of Mercer University School of Medicine, reported a case where migraine symptoms were triggered by sucralose in a physician with a history of migraines. People with allergies or sensitivity to sucralose may also experience migraines. People who have allergies or sensitivities to sucralose may experience more severe reactions than others. Possible signs of an allergy or sensitivity reaction include rash, flushing, anxiety, dizziness, numbness, abdominal pain and cramping and bladder problems. Sucralose has been in general use for over 10 years, but no long-term studies of its effects exist. While the U.S. Food and Drug Administration considers sucralose safe for long-term use, even in pregnant women and children, concerned health advocates recommend sparing use and not giving sucralose to children until long-term effects are thoroughly studied.